When twenty-two-year-old Jennifer Worth, from a comfortable middle-class upbringing, went to work as a midwife in the poorest section of postwar London, she not only delivered hundreds of babies and touched many lives, she also became the neighborhood's most vivid chronicler. Call the Midwife: Farewell to the East End is the last book in Worth's memoir trilogy, which the Times Literary Supplement described as "powerful stories with sweet charm and controlled outrage" in the face of dire circumstances. Here, at last, is the full story of Chummy's delightful courtship and wedding. We also meet Megan'mave, identical twins who share a browbeaten husband, and return to Sister Monica Joan, who is in top eccentric form. As in Worth's first two books, Call the Midwife: A Memoir of Birth, Joy, and Hard Times and Call the Midwife: Shadows of the Workhouse, the vividly portrayed denizens of a postwar East End contend with the trials of extreme poverty--unsanitary conditions, hunger, and disease--and find surprising ways to thrive in their tightly knit community. 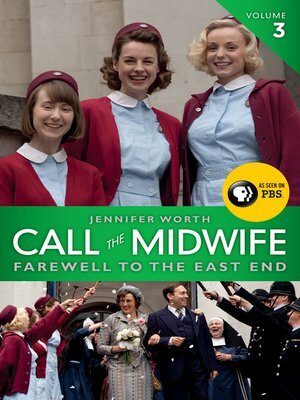 A rich portrait of a bygone era of comradeship and midwifery populated by unforgettable characters, Call the Midwife: Farewell to the East End will appeal to readers of Frank McCourt, Katherine Boo, and James Herriot, as well as to the fans of the acclaimed PBS show based on the trilogy.